Special 8-4 is the fourth level of Special 8 in Super Mario 3D Land. It is based off of World 8-6. The player starts off on a platform next to some platforms that sink into the lava if they are stood on. After these is a platform that spins in the direction that it is run on, which leads to a Warp Box. The Warp Box leads to an area with a Dry Bones and a platform that moves when stood on. This platform goes to a cylindrical mesh that leads to a rotating platform with a Warp Box at the end. The Warp Box leads to the final area which has another cylindrical mesh and the Goal Pole. Star Medal 1: At the end of the large nut and bolt platform that needs to be spun counterclockwise, the Star Medal is found. 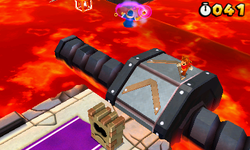 Star Medal 2: When the player is using the cylindrical mesh to get across the lava there will be a platform with the Star Medal next to it. Star Medal 3: Near the end of the level, the third Star Medal is next to the platform with the Warp Box.